Overall, this tour was a nice way to leave Rome and see other cities south. We had hotel pick up, which took us to the main Grey Line location. From there, we were sorted to the correct bus to go to Naples, Pompeii, Sorrento & Capri. Day 1 was leaving Rome, driving to Naples. Based on other reviews, I wasn't sure what to expect in Naples, and it was better than I expected! We drove along the coast while the guide told us about what we were seeing, then stopped so we could take pictures overlooking the water. It was nice. Then we stopped and had lunch. It was a nice lunch, gave us an opportunity to try food we would not have otherwise. It also gave us time to talk to other travelers on the trip. After lunch, we continued on to Pompeii, where our bus was slit into 2 or 3 tour groups (I think they try for no more than 20 per guide). We didn't have to wait in line for tickets, which is nice. The guide was knowledgeable and excited about the tour. After the Pompeii tour ended, we had about 1/2 hour to have a drink or snack before boarding the bus. We changed buses so only those continuing on to Sorrento were together (part of the group boarded our original bus to return to Rome). Once in Sorrento, we were dropped off at our hotel. Our hotel stay included dinner and breakfast - and both meal were HUGE! And good! And the staff was great. We selected the highest hotel option available, so I don't know how much that affects this. We would very close to the main piazza of Sorrento and walked around there that night. Day 2 we had breakfast at the hotel, then was picked up and taken to the port where we met our tour guide for the day to go to Capri. She was fantastic! We took the ferry over (the tour guide gave us the tickets, so we didn't need to wait in line to obtain tickets). We did have to wait in line to board the ferry, but I don't see how else that could have been handled. We were lucky and were able to see the Blue Grotto! It was great. We had different drivers throughout the day. We had time to take the chair lift to the top and back down before lunch. Then a bit of free time before we needed to board the ferry back to Sorrento. Those returning to Rome took a ferry to Naples to continue to Rome. Since we were staying the 2nd night, we took the ferry to Sorrento and were taken back to our hotel. We had another night to walk around Sorrento and dinner at the hotel. 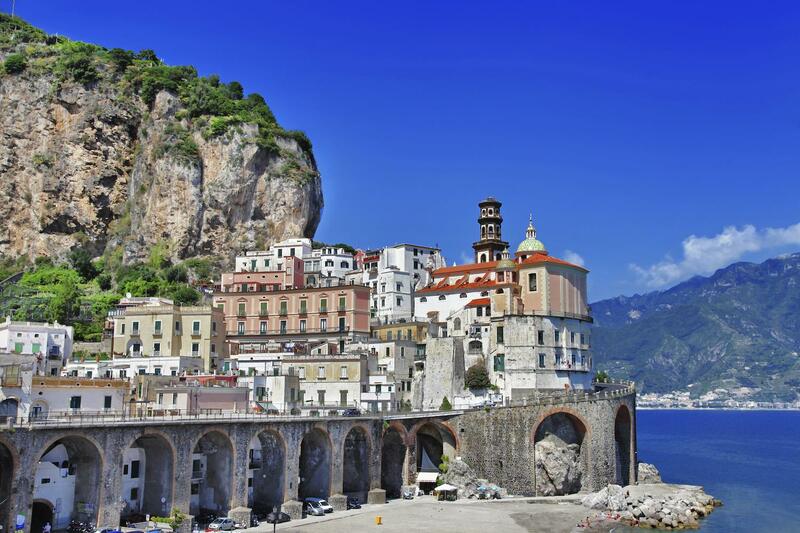 Day 3 is a free day, so we hired a driver to take us to Positano, Ravello and Amalfi. It took 7 hours, so plan for that! It was definitely worth it. The coast is so neat! And we took a boat ride from Amalfi, which shows the coast line differently than on land (recommended). The bus picked us up from our hotel at 3 pm, with a transfer (and change of bus) at Pompeii. We arrived late to Rome (9:30pm) which was about an hour later than normal because of accidents and heavy traffic. I liked the tour. The only downside is we didn't have an itinerary or know which hotel we were staying at until that day (and I like to plan). But overall, I would recommend it! It was a whirlwind to do in 3 days so well done considering those constraints. The only low light was a really poor meal ( mostly the choice and the service ) in Capri which was included in the tour. Who wants to have a rushed, lousy meal in Capri? We were directed to visit the shops and souvenir stands which were plentiful but wished we'd just found a great restaurant and had a leisurely lunch even if we paid ourselves instead.On the plus side our hotel in Sorrento was fabulous both service and meals and well worth the small upgrade in price we paid.